When you’re not watching art tutorials it’s nice to have something else in the background while drawing or painting. Many artists enjoy listening to music which is an obvious choice. But another choice is to stream podcasts while you work. There are many great art-related podcasts that talk about artistic skills and the entertainment industry. If you’re looking for some inspirational listening material while you draw this list will definitely have something for you. Chris Oatley works as a Disney character artist but also teaches courses to students hoping to get into the animation industry. You can read more on his bio page regarding what he does and why he teaches. Chris actually hosts two different yet related podcasts. The Paper Wings Show talks with other artists about the current art industry, their journey into their career, and shares tips/advice for aspiring artists. The Chris Oatley Artcast is very similar but focuses more on interviews that spotlight unique artists and talking points about the industry. Both podcasts are incredible and to be honest they both seem like the same podcast to me. All the episodes of both shows can be found on Chris Oatley’s YouTube channel which updates frequently. Most episodes run for over an hour so you can get a lot of drawing done with these interviews running in the background. Chris primarily focuses on animation and visual development since his knowledge is in the animation industry. But he sometimes talks about concept art too. I’d say these podcasts are perfect for anyone interested in the entertainment industry as a whole. Anyone who’s looked into concept art should recognize the name Feng Zhu. He’s a skilled professional with over 20 years experience in the concept art industry. Feng is now primarily a teacher running his own concept art school in Singapore named FZD School of Design. The school focuses on the fundamentals of entertainment design forcing students to master the fundamentals with a surprising success rate. But he also does a podcast called Design Cinema on his FZD YouTube channel. Episodes usually range from 40-60mins but can be longer too. There aren’t too many interviews on this channel but you don’t really need them. Feng has decades of experience with his early work on video games dating to the 1990s. Most episodes cover specific skills that you need to have as a working concept artist. If there’s any podcast worth listening to for concept art tips it’s definitely this one. Even if you’re not into concept art there are still valuable topics covered that relate to general art & entertainment design. Everyone should recognize the name Nickelodeon. It’s one of the premiere TV studios for kids cartoons & young adult programming. The most popular art-based content on Nick comes from their lineup of animated series. Recently the team launched the Nick Animation Podcast which features writers, artists, and voice actors from popular animated shows. Each episode typically lasts 30-60 minutes with lots of great Q&As about the animation industry. If you don’t want to go through iTunes you can stream all these podcasts from the Nick Animation YouTube. New episodes are added sporadically so it’s tough to say how many you can expect in any given month. But each episode features high-quality recording and some really cool behind-the-scenes info about the Nick animation studios in Burbank. 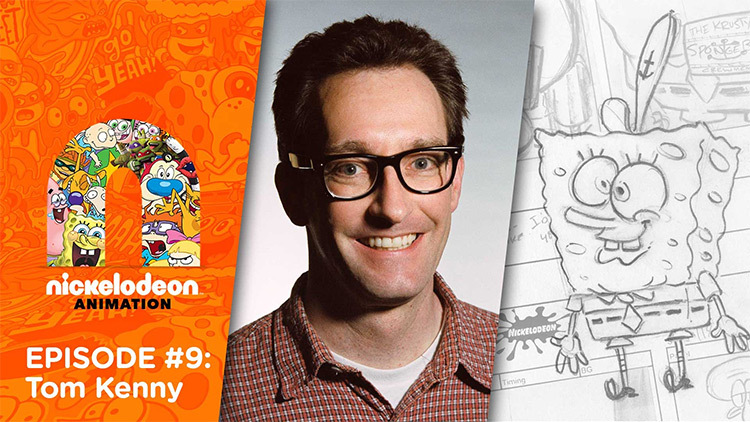 The Nick Animation Podcast is a must-listen for aspiring animators. If you want to become a storyboard artist, character designer, background painter or anything else related to cartooning then this podcast is for you. One more really popular animation podcast is the Animation Network Podcast hosted by Kris Wimberly. He got his career started as a Nick intern on SpongeBob in 2008. Since then he has been working in the animation industry building connections and learning about the work that goes into every cartoon. His Animation Network Podcast features interviews with voice actors, animators, story artists, writers, and producers from all the major Hollywood animation production studios. Episodes are full of detailed questions and often touch upon each person’s journey into the animation industry. You can find full episodes on the podcast website or stream them from the Podbean archive. New episodes are added frequently and right now there’s already 60+ episodes in the vault. Kris is a fantastic host and very knowledgeable about animation. This is undeniably one of the best animation-based podcasts to save to your bookmarks. Content is fresh and you’ll always learn something new with each episode. This is a podcast that I only recently found but already love. Lean Into Art is hosted by Jerzy Drozd and features all kinds of topics for artists. Most episodes run over an hour long so it’s easy to let this stream and dive right into your work. Some episodes have guests while others are discussion-based talking about things related to the business and artistic side of working as a professional artist. You can find all the latest episodes on this YouTube channel or stream them from the LIA website. Recording quality is great and there are many topics geared towards all forms of entertainment art including concept art, animation, and comics. Although Syn Studio is a Montreal-based art school it’s also a fun podcast for aspiring concept artists to stream in the background while drawing/painting. The Syn Studio Podcast focuses solely on interviews with working professionals. Each episode spotlights a professional in the industry who shares their journey and some tips for aspiring artists. Most interviews run 60-90 minutes long and there’s already a growing list of 30+ archived interviews with talented professionals. I really like this podcast as a complement to the FZD School podcast. They’re both used as a means of promoting the school, but they focus on different strategies. FZD shares tips & industry advice while Syn Studio covers interviews with professionals. Check out the Syn Studio YouTube if you want to learn more. It has all the podcast episodes along with behind-the-scenes videos promoting their Montreal art academy. If you’re an aspiring concept artist or game designer then Level Up! is a podcast you have to bookmark. The podcast is hosted by Wojtek Fus and Darek Zabrocki, two Polish artists who want to share their love for the gaming industry. What I enjoy most about their podcast is that each episode is treated as a livestream. Most episodes run for over 2 hours so you’re getting a lot of content with each one. Their podcast focuses on interviews with working professionals who have a story to tell. So every episode will feature a concept artist sharing their story of how they got their first break into the industry. You’ll also get lots of great tips and suggestions for improving your work, life, and personality to mesh well with a studio environment. I cannot think of many other better podcasts for an aspiring concept artist. Level Up! will improve your knowledge of the video game industry and help you understand what it takes to become a professional artist. If you’re already putting in the work and grinding hard to improve then this podcast will fit nicely in the background. And with each session averaging 2+ hours you’ll have plenty of material to go through. 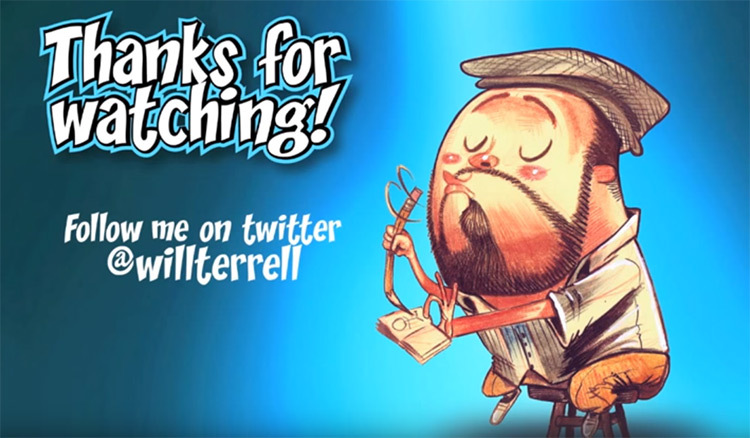 I’m a big fan of Will Terrell and I actually first found his work through YouTube. He doesn’t really do a podcast, but he does do frequent recordings on his YouTube page where he shares advice and tips for artists. You might think of this as an informal lecture where Will does a bit of drawing and talks about his journey as an artist. He currently works as a freelancer for Warner Bros. helping with animation and illustration work. I think Will’s style of illustration is captivating enough to draw attention from anyone. You can see a lot of his work on his Instagram @WillTerrell. He doesn’t have a set schedule for uploading videos but if you want to check out his YouTube you might really enjoy his recordings. The talented illustrator Jake Parker is another artist who does podcast-y type recordings on Youtube. Most videos on Jake’s YouTube page follow the same format of him drawing/inking some art while talking about something else. His videos are much shorter typically averaging 15-30 minutes. He also has smaller 2-5 minute quick tip videos with art suggestions and promos sharing news about his latest work. Jake is the creator of InkTober, a month-long challenge where artists do one drawing a day for the entirety of October using only ink. It started in 2009 and has since grown to a worldwide phenomenon. While I do love his art style, his YouTube videos are somewhat scattered in quality. If you’re looking for something in the background this may not be the best podcast to choose. But if you like Jake’s work then you’ll definitely want to check out his lengthier episodes since they can be quite inspirational. Xia Taptara is another talented artist with a history of concept art dating back to 2002. He started online video tutorials in 2007 and has since increased his YouTube channel to include lengthier podcast-style interviews. You will need to dig through the videos to find exactly what you’re looking for because Xia uploads a lot of content. Many videos are 10-20 minute tutorials showing how to do something or critiquing someone else’s work. These are great to watch, but not so great as background noise. However his interviews and lecture-based content would be great in the background while drawing. For example he has a 12min video answering questions about how to break into the concept art industry. Very insightful video in my opinion. Most of his interviews are much longer spanning 40-60 minutes on average. If you like his art style then I recommend picking out your favorite videos from his channel and bookmarking them for later. His stuff is great but you’ll want to separate the visual content from the stuff that’s mostly audio so you have can save videos to play in the background. One more artist that I’d highly recommend listening to is Bobby Chiu. He works in the entertainment industry on pre-production artwork for movies and TV shows. He also works with Schoolism, an online learning resource for artists. But if you check out his YouTube page you’ll find a ton of cool interviews with talented artists all over the world. Most of his interviews span a full 60 minutes which is great when you just need something to run in the background. Unfortunately his YouTube channel isn’t just a podcast archive. It does contain a bunch of other content related to Schoolism and mini lessons for self-taught artists. While this content is all really cool it’s not all great for background noise. But the interviews are stunning and they’re well worth subscribing to his account. He interviews professional artists working as video game concept artists, illustrators, animators, and other related art fields. All of these podcasts and YouTube channels are some of my favorites that I listen to frequently. I think they’re powerful resources to help you push through creative block and keep you inspired while churning away at frustrating exercises. Art is hard and there’s no shortcut to improve. But having the right mindset is key, and I hope these podcasts can help you find(and stay in) that mindset more frequently.